Ask a Question / How to do a laser pointer that can be interrupted? Hope this makes sense. I've seen this in a fun game called Deadly 30 and would love to implement it in a game of my own. You can see how the laser pointer goes directly towards the mouse pointer. 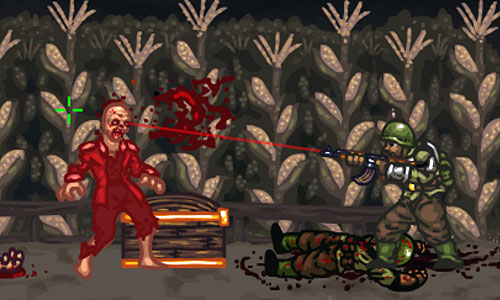 As there is a zombie in the way, the laser is blocked from going further. If there was no zombie on screen to block it then the laser would go all the way to the mouse pointer, through it and off screen. Make sure the actor is not set to "minimal" in its physics settings. This was the issue thank you! Ask a Question / refer an actor to the scene co-ords? I want to draw a line between an actor as it moves and a set of X,Y co-ords in the game scene. I can't find how to refer the actor to the scene co-ords. All co-ords refer to the space the actor takes up. Maybe it's not possible to draw from the actors draw event to the game scene....? Getting back into stencyl after a long layoff and struggling to get the brain cells up and running again. I am creating an actor when i click on screen. This works ok. The actor doesnt move. In physics/general it is allowed to move. How do I find out the angle of the mouse away from the set of co-ordinates so i can draw a line that direction? Why does this simple bit of code not work? Text just isn't showing where it should. Text is definitely a different color to background. Font is used ok elsewhere in scene. Ask a Question / Actors are outlined? why? Just getting back into stencyl after a long layoff. All my actors graphics seem to be outlined and I have no idea why? This should be a 25px white square with a solid green 1px edge. But it's showing with some sort of pinkish outline halo effect..? Ask a Question / Re: Reverse engineer game from SWF or .stencyl file? Ask a Question / Reverse engineer game from SWF or .stencyl file? I can't seem to find the project files (.stencyl) for an old game of mine, though I seem to have the swf and final apk file. Is there anything I can do with these output files to get the `input` code that created them? Seems legit, hope it helps someone. "Here are more than 500 premium sound effects – for free! These sounds are hand-picked from their premium libraries to give you a taste of their work – all ready to be used in your current or future projects. " also, no need to use CAPS in your title. Everyones question is urgent. To them. Ask a Question / Re: How to use less memory for effects? What about making the bitmaps half the size and using stencyl to enlarge them while in use?